We entered the new century with tools that we could only imagine before: computers that fit on our laps, phones that travel with us everywhere and not only allow us to talk to each other, but to get information, send messages and watch movies. Information is available all hours of the day and night. Our children entering school now have never lived without these tools. It is our job as parents and educators to teach them how to effectively use these tools and the information available through them. Teacher librarians are uniquely placed to provide this instruction to students, and to collaborate with their classroom teachers in designing lessons that teach students how to navigate through the incredible amounts of information that they face. A teacher librarian is a teacher credentialed in a content area [English, History, Art, etc] and also holds a supplemental Teacher Librarian credential. Many teacher librarians also hold a master’s degree in Library Science [MLS or MLIS]. Why do we need librarians now that we have the Internet? It is a misconception that all the answers students need can be found on the Internet. The Internet is a big, unorganized, unsupervised place, and students need guidance now more than ever. With instruction from a teacher librarian, students learn how to navigate this vast world of information while practicing safety, applying ethical standards and learning responsible research practices. Why do we need libraries now that we have the Internet? A strong school library -- one staffed by the team of teacher librarian and support clerk -- is a dynamic learning center where students learn new research skills, practice skills they learn in class, research information they need for assignments and find good books to read. 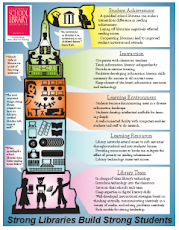 What does the research tell us about school libraries? More than twenty state studies – including one in California by Dr Doug Achterman on "Haves, Halves and Havenots: School Libraries and Student Achievement" – have shown that the presence of a dynamic teacher librarian supported by clerical staff raises achievement. We have a great public library – why do we need a school library? The library missions and users are very different, but complementary. How can I help my school get a teacher librarian? There are many ways that you can advocate for your school: become a member of the Site Council; join the PTA or other parent group; gather parents together to attend school board meetings;learn more about school libraries and how three moms in Washington State changed the legislative landscape for school libraries in that state; form a task force to advocate for school libraries in your town.